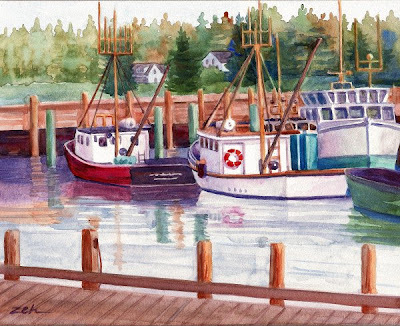 This painting is based on a scene from beautiful Grand Manan Island which can be accessed by a ferry from Blacks Harbour, New Brunswick. The island is close to the northernmost part of Maine. Part of New Brunswick, it is situated offshore at the eastern tip of the US/Canada border. Fishing, aquaculture (fish, shellfish & kelp farming) and tourism are the sole basis of the economy here. It's a quiet place to escape from the hustle and bustle of everyday 21st century life. Geologist friends of mine own a home on the island and live there year-round. They claim that there are many interesting rock specimens to find. They tell me that the winters are not harsh, as I'd thought. They are actually warmer than New England winters due to being surrounded by warm ocean waters. Still, it's probably not Jamaica...so bring a sweater or something when you go! This painting has been sold, but if you would like a print made, please contact me.